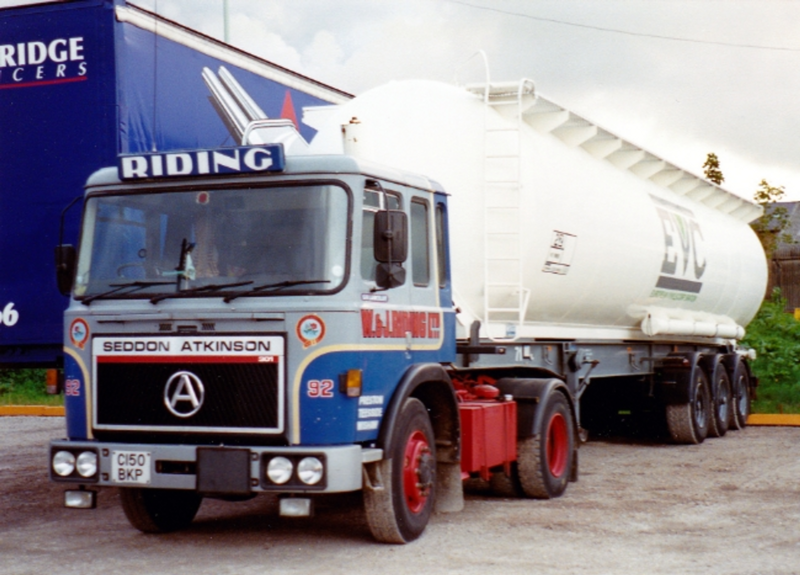 In March 1983 Seddon Atkinson launched its new 301 tractor unit, powered by and designed around the new Cummins LT10 10 litre engine. 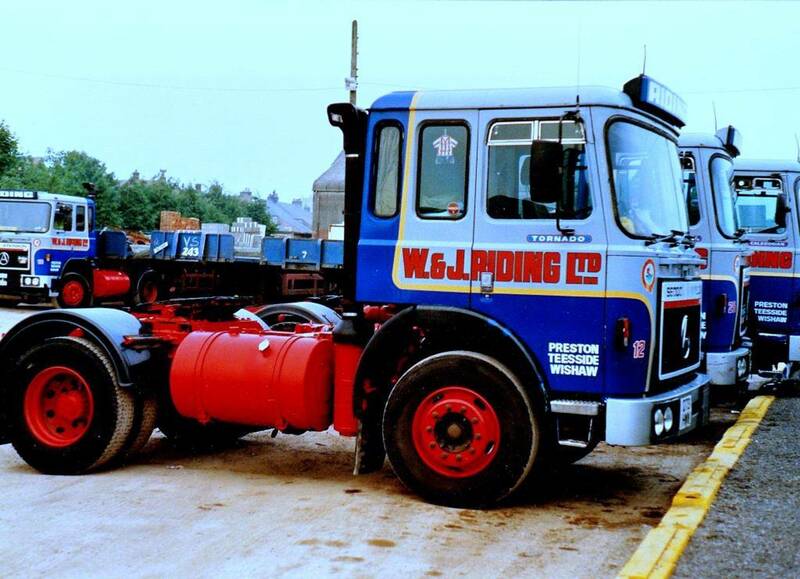 They were built to a light kerb weight of under six tons and a high specification incorporating the Spicer SST 8010-4B 10 speed constant-mesh splitter box or the alternative Fuller RT7609 nine-speed range-change 11-tonne rear axle. 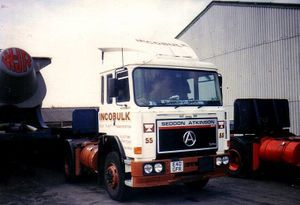 Seddon Atkinson had the 401 cab shell mounted much lower on the 301 chassis making it look smaller than it's 401 brother. 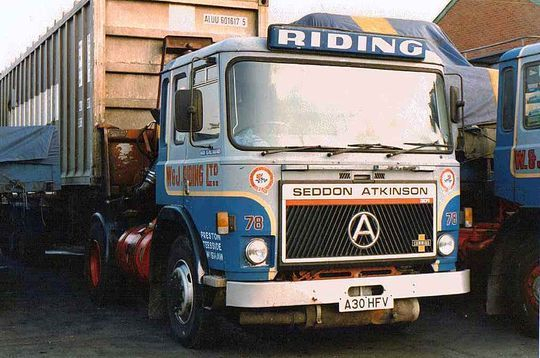 "We ran a number of these lightweight cabbed Seddon Atkinson 301 Series 4X2 tractor unit's, later to become the 3-11 Series, which were actually designed and launched as a 38 tonner originally built to take on the might of Volvo, Mercedes and DAF". 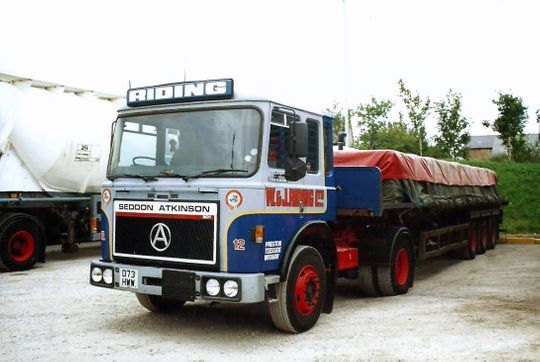 Riding's ran a small number of these lightweight cabbed Seddon Atkinson 301 Series 4X2 tractor unit's which were actually designed and launched as a 38-tonner. was originally painted in the cream and brown Iconbulk contract livery seen here on the right. 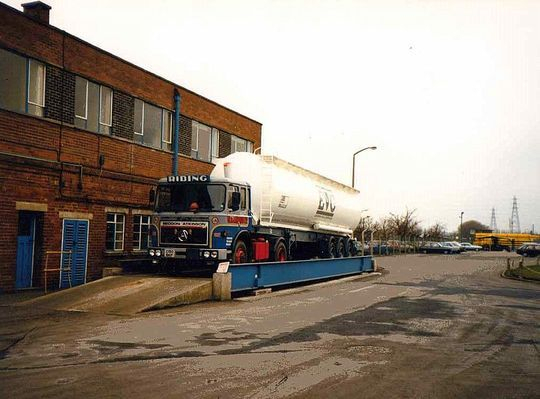 Driven from new by Mick Mckay it came with a Cummins L10 250 engine but Riding's later rebuilt the engine into the more powerful Cummins L10 290. An interesting shot of Seddon Atkinson 301 Series 4X2 tractor unit Reg No A130 HCK Fleet No 77 'Sir Tristram'. 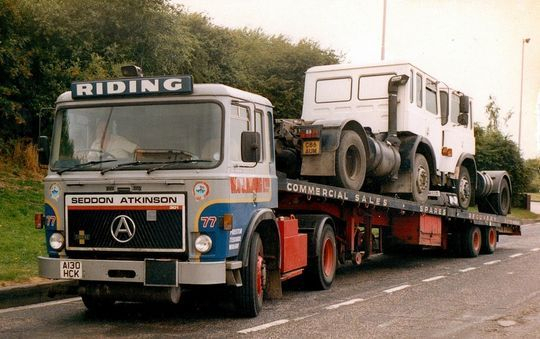 It is pictured here parked up on the M62 Hartshead Moor service area in West Yorkshire while hauling a tandem axle sloping trailer belonging to Tom Riding's late good dealer friend Syd Hartley. 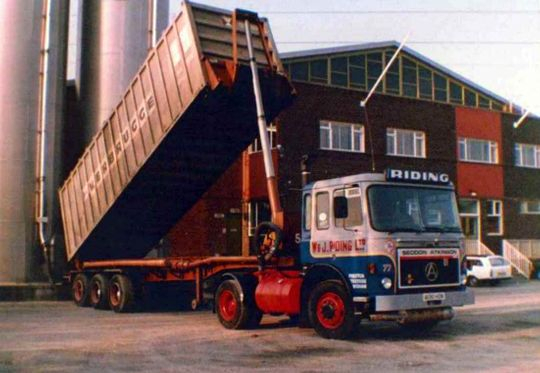 "The load is two C registered 301 4X2 tractor units that were enroute to Syd's yard at Longridge but this time he didn't manage to sell them to me!" Seddon Atkinson 301 Series 4x2 tractor unit Reg No A130 HCK 'Sir Tristram is pictured here in 1986 a few days after coming out of Riding's workshops following a complete rebuild. It had been very badly damaged going through Blubberhouses when an out of control 8 wheel tipper coming out of a side road slammed into the side of it, fortunately driver Mick McKay came through the ordeal ok.
Seen here at Walki Converters of Garstang it is tipping a box that had been collected at Hull and when empty it would be loaded at ICI Ltd Runcorn for return to Sweden. Seddon Atkinson 301 Series 4x2 tractor unit Reg No A130 HCK 'Sir Tristram, driven at the time by Mick McKay, is pictured here tipping an Incobulk container near Albertville in South East France. 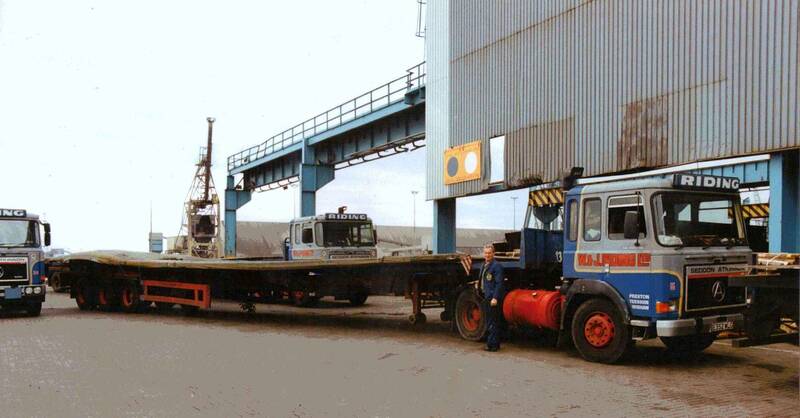 "The load was plastic pellets coming from BXL Grangemouth note the new spare tyre fastened to the tipping ram. 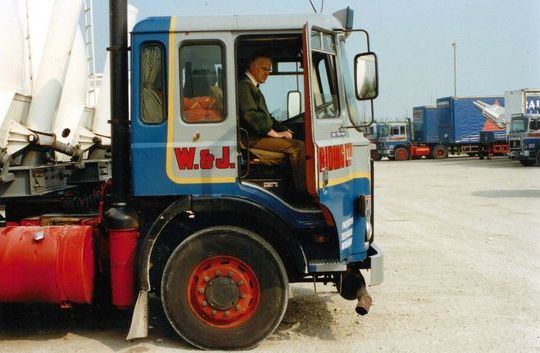 There was very little room to carry a spare super single wheel and tyre on the trailer and in the early days of tri axle trailers the tyres weren't very reliable so we thought it better to be safe than to be stuck in France with a tyre failure". Tom Riding, pictured in the driving seat, fires up the engine of Seddon Atkinson 301 Series 4x2 tractor unit Reg No A130 HCK 'Sir Tristram' to check the engine it is running ok.
From this angle you can clearly see how the 401 cab shell is mounted much lower on the 301 chassis making it look smaller than it's taller 401 brother. For some unknown reason Seddon Atkinson 301 Series 4X2 tractor unit Reg No A130 HCK Fleet No 77 'Sir Tristram' seemed to get photographed everywhere it went. 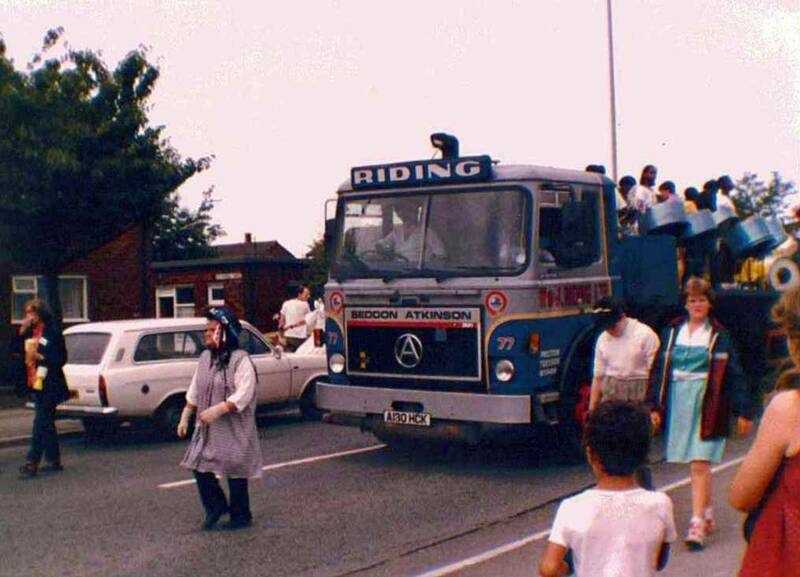 In this particular photograph it is pictured on Gamull Lane Preston while taking part in a Caribbean Carnival parade in 1985. Another shot of Seddon Atkinson 301 Series 4X2 tractor unit Reg No A130 HCK Fleet No 77 'Sir Tristram'. Registered new on the 1st of August 1983 and driven from new by Mick Mckay it is seen here in November 1995 after many years service in the fleet shortly before being demoted to being the yard shunter. 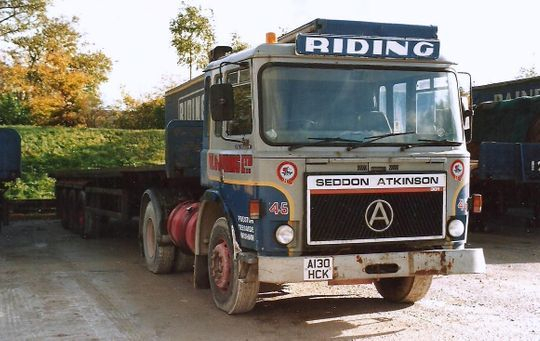 Seddon Atkinson 301 Series 4X2 tractor unit Reg No A130 HCK Fleet No 77 'Sir Tristram' is seen here in a sorry state in 1998 after spending a number of years demoted to yard shunter in the Longridge depot. 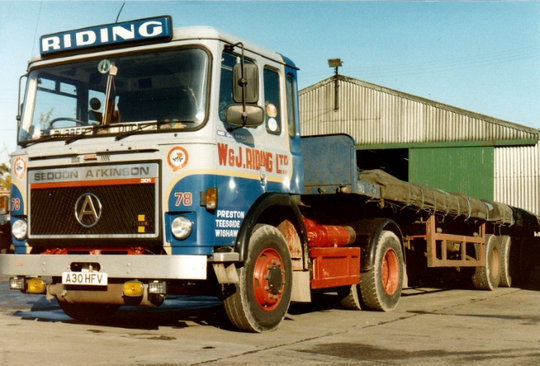 Although all the road going fleet were re-branded in TDG livery A130 HCK escaped and remained in W & J Riding livery as a shunter until it was finally scrapped in 1999, having last been taxed and tested in August 1995. Another Seddon Atkinson 301 Series 4x2 tractor unit in the fleet was Reg No A30 HFV Fleet No 78 'Sir Galahad' which is seen here in the depot at Longridge patiently awaiting its next assignment. 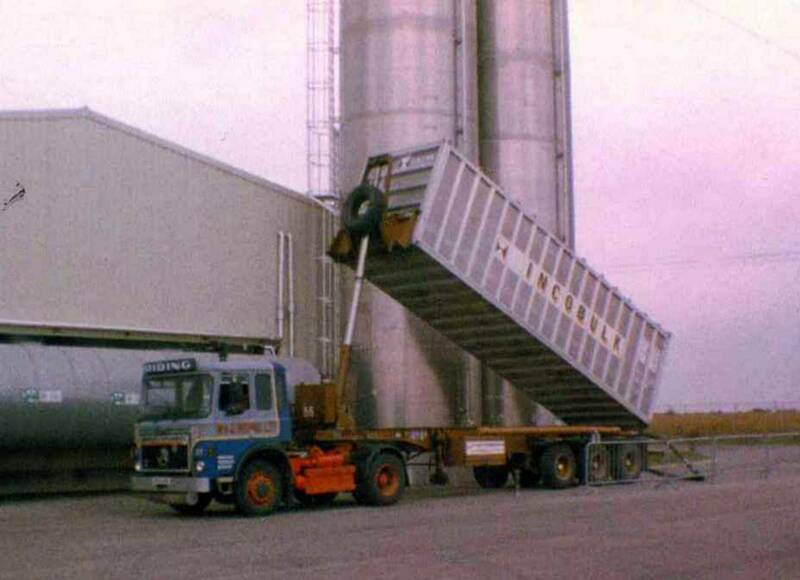 Coupled up to a Incobulk 30 foot container loaded with plastic products the trailer would have be fitted with a rotary feeder through which the product dropped and was then blown into a silo. Another shot of Seddon Atkinson 301 Series 4x2 tractor unit Reg No A30 HFV Fleet No 78 'Sir Galahad'. Parked up in Longridge depot it is seen here coupled up to a tri-axle flat trailer which is loaded with steel plate from the British Steel Works at Motherwell. Seddon Atkinson 301 Series 4X2 tractor unit Reg No C150 BKP Fleet No 92 'Sir Lancelot', powered by a Cummins L10 290 engine in line with a Spicer 10 speed splitter gearbox, was registered new on the 1st of October 1985. "I bought this particular unit from Translitre of Burton on Trent for £16,150 plus vat on 18th of May 1987 and was told it had been bought by an operator in Kent to help transport all the fallen trees caused by the high winds at the time. After the clear up it became surplus to requirements and was sold on. 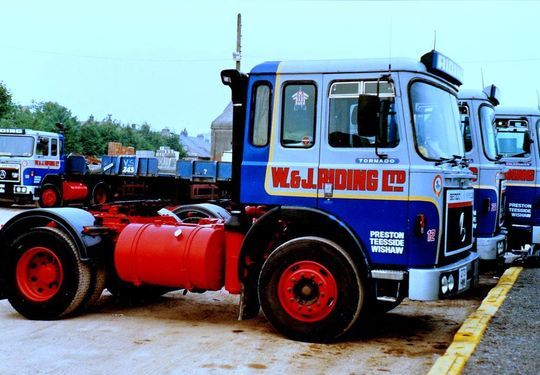 It proved to be a useful tool for us and i eventually sold it on the 20th of January 1993 to North West Truck Centre for £1,800 plus vat". 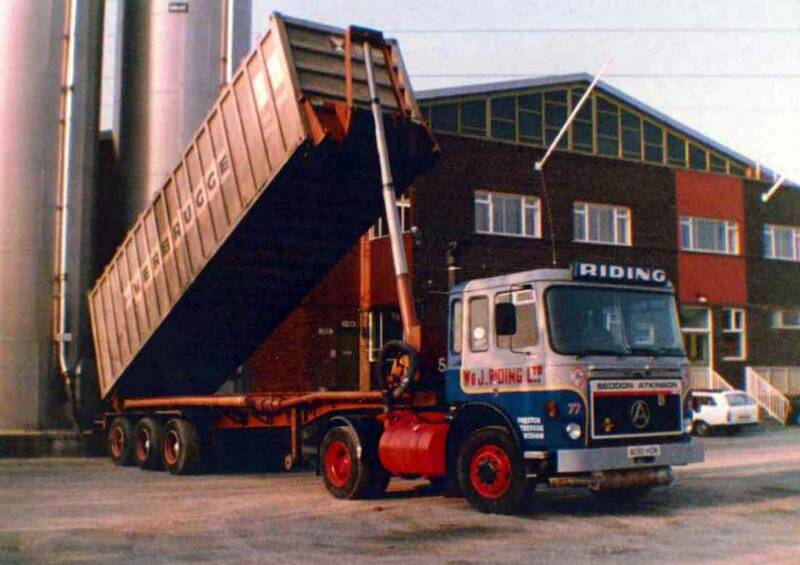 It is seen here at Longridge depot coupled up to a Metalair 2000 cubic foot tipping powder tanker. 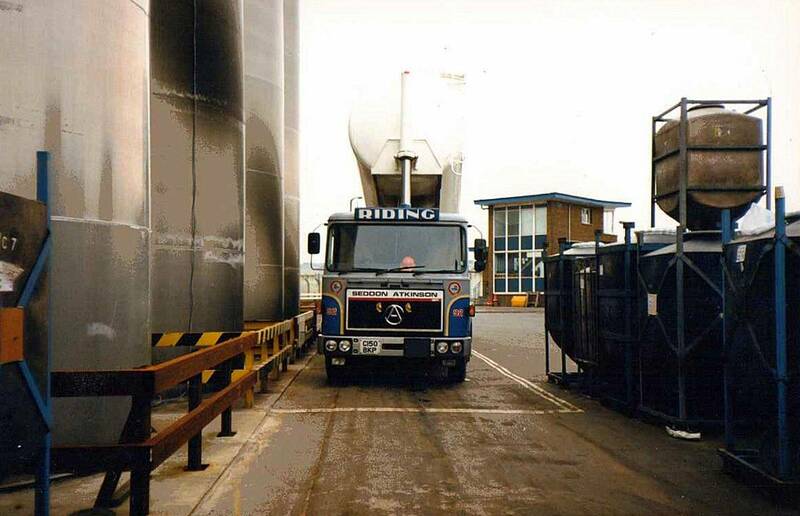 Seddon Atkinson 301 Series 4X2 tractor unit Reg No C150 BKP Fleet No 92 'Sir Lancelot' is pictured here on the weighbridge at the Yorkshire Imperial Plastics factory at Leeds shortly before discharging it's load of plastic granules. Coupled to a Metalair 2000 cubic foot tipping powder tanker it was driven at the time by Mick McKay who also took the picture. 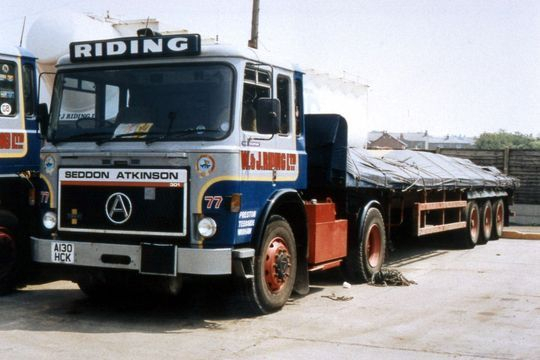 Another shot taken at the Yorkshire Imperial Plastics plant at Leeds shows Seddon Atkinson 301 Series 4X2 tractor unit Reg No C150 BKP Fleet No 92 'Sir Lancelot' parked in position discharging a load of plastic granules. Seddon Atkinson 301 Series 4X2 tractor unit Reg No D73 HWW Fleet No 12 'Tornado' was powered by a Cummins L10 290 engine. Originally registered on the 5th of August 1986 Tom Riding bought it when it was three years old off a Mr Sydney Hartley on the 5th of September 1989 for £9,000 plus vat. 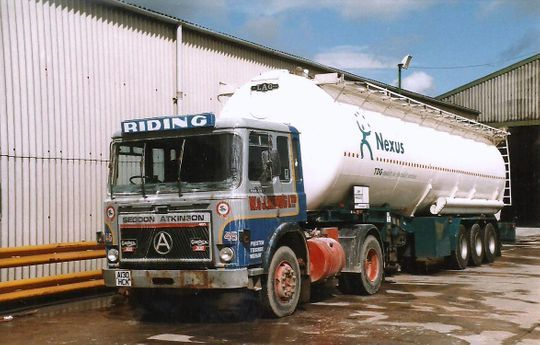 It worked on general haulage for several years until it was sold on to J Stirland of Nottingham for £2,750 plus vat on the 1st of March 1993. It is seen here hauling a forty foot tri-axle flat trailer loaded with 24 tons of bagged cement loaded at Clitheroe for onward shipment to Coatbridge. A side view of Seddon Atkinson 301 Series 4X2 tractor unit Reg No D73 HWW Fleet No 12 'Tornado'. Powered by a Cummins L10 290 engine it was three years old when it joined the fleet after being purchased second hand off a Mr Sydney Hartley on the 5th of September 1989 for £9,000 plus vat. Seen here not long after receiving it's Riding livery it worked on general haulage for several years until it was sold on to J Stirland of Nottingham for £2,750 plus vat on the 1st of March 1993. Seddon Atkinson 301 Series 4X2 tractor unit Reg No E352 WLG 'Sir Percivale', registered new on the 3rd of September 1987, is seen here with it's tri-axle trombone trailer fully extended. Clicking on the picture to view it full size will give you a better perspective of how long the trailer really is. 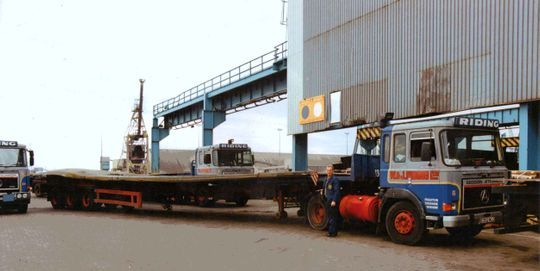 It had transported the steel plates from the British Steel Works at Motherwell to Tees Dock which was regular traffic for Riding's in those days. Alan Margerison was the regular driver of E352 and he looks quite happy with things as he takes time out for a photograph.